Our firm has a very modern and sprawling infrastructure which has all the latest and sophisticated facilities to manufacture PET Strap Plant. These are provided with Helical Gear Box with Inbuilt Thrust Bearing for better performance. Our veteran engineers only use qualitative components and contemporary technology while manufacturing this machine. Besides, we assure our clients that this machine is quality tested against predefined quality parameters, in order to meet international standards. PP HDPE PET BOX STRAPPING MACHINE PLASTIC Pet Box Strapping Plant, PET Strap Plant, Pet Box Strap Machine, Pet Strap Line, Pet Strapping Plant, Pet Strapping Production Line Ocean Extrusions PVT LTD Our firm has a very modern and sprawling infrastructure which has all the latest and sophisticated facilities to manufacture High quality pet strap plant. These are provided with Helical Gear Box with Inbuilt Thrust Bearing for better performance. Our veteran engineers only use qualitative components and contemporary technology while manufacturing this machine. 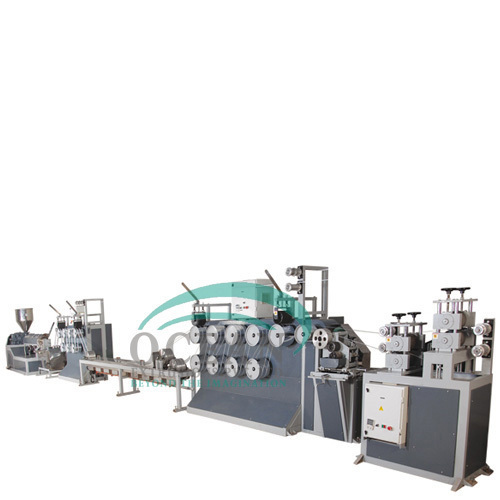 Besides, we assure our clients that this machine is quality tested against predefined quality parameters, in order to meet international standards. Process Material : Pet Highest Production Line Capacity in the same class of Machinery Specially Designed Control Panel for Saving up to 25% Power Consumption resulting in Optimum Product Costing compared to Conventional Machinery of the same class.